Don’t Throw That Paint Away! – Martha Rose Construction leads the home building industry by building Green High-Performance Homes. Don’t Throw That Paint Away! 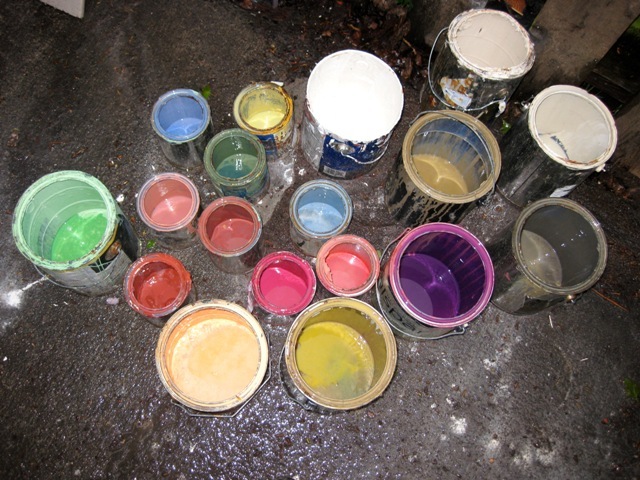 While cleaning out a storage shed that held miscellaneous from years of revolving tenants, I came across many cans of paint. Gallons and quarts, some almost full, most almost empty, bright and dull colors, flat and sheen finishes, but all having one common characteristic – they were all water based. So, into (2) five gallon buckets they were all emptied, then systematically poured back and forth to get a thorough mixing. Now this technique can have a not so pleasant outcome, but I got lucky and ended up with 7 gallons of a color I named “Bellingham Adobe”.